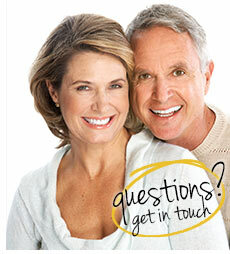 When it comes to using your bath or shower enclosure, everyone's preferences are entirely their own. Some people prefer a passive drenching experience, whilst others prefer a high pressure, multiple jet shower enclosure. Regardless of your preferences, the water system that you've got installed in your home will dictate how your new shower enclosure or bath will perform. Typically, newer systems tend to offer better performance figures than older systems, but some older water systems can be upgraded to improve overall operation. The following guide has been provided by our technical team to help you identify what water system you have in your home. When it comes to Di Vapor Steam Showers, you'll want to make sure you have the right water system for the best possible bathing experience. 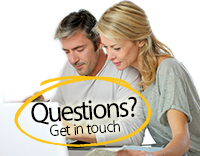 If you have questions regarding your water system, please feel free to speak to our friendly technical staff at 08454 650 800. This system relies on a cold water tank which is normally located at a high point in the property such as an attic or loft space. This cold water tank then utilises the natural force of gravity to feed water into a hot water cylinder located below, typically found in an airing cupboard or under the stairs. 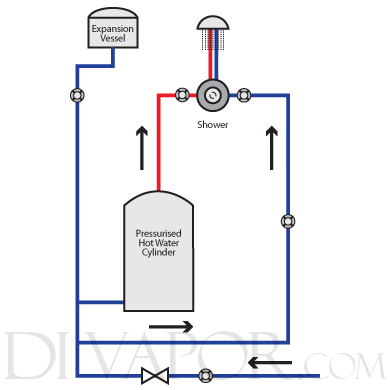 Water is then heated in the hot water cylinder and stored until required by the user at source such as a shower enclosure or bath. Working with a similar theory as a hot and cold gravity fed system, a cold tank is stored in a high location at the property such as the attic or loft space which feeds a hot water cylinder below. However, as the cold water is mains fed the pressure tends to be significantly higher than the hot feed which results in an unbalanced pressure between the feeds. A pressure equalising valve works to solve this issue by keeping both feeds constant, ensuring the strongest feed is kept as close to the weakest feed as possible. As with a standard hot and cold gravity fed water system, a cold water storage tank is located at a high point in the property such as the attic or loft. This cold water storage tank then feeds into a hot water cylinder below which works to heat the water to the desired temperature. Both supplies are then fed into an electric pump which works to pump the water at a high pressure to a desired location in the property such as a shower enclosure or bathroom. This higher volume of water can be achieved with most gravity fed water systems with very little outlay cost. 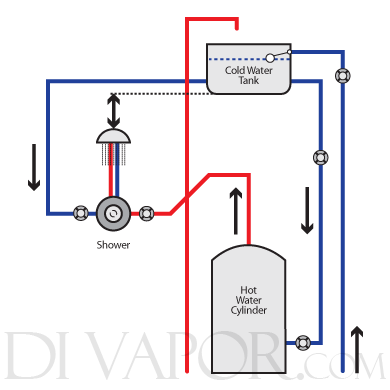 An unvented system works by pressurising the main hot water cylinder in order to output the hot water feed at high pressure with good flow. There is no need for a cold water storage tank as this system utilises the cold feed directly from the mains, as the pressurised hot water cylinder is able to match the high pressure of the cold mains feed. With a highly expected performance, unvented systems tend to be more expensive when compared to possible alternatives, often considered for larger homes rather than smaller properties. Known for their ease of installation, a combination boiler can be found installed anywhere in a property such as a kitchen or utility room. A combination boiler works by heating water supplied from the mains, outputting an equal pressure of hot and cold water on demand. 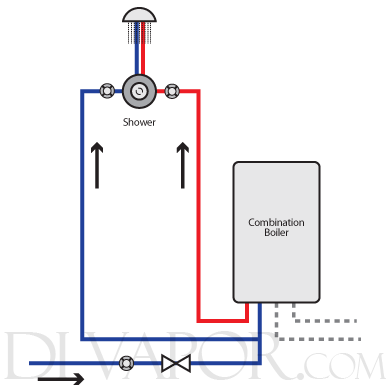 Considered as a relatively affordable water system option, a "combi" boiler does not require a hot water cylinder or cold water storage tank. Most systems will also offer provision to supply hot water to the central heating system, complete with programmable timers to set up heating cycles for your home. There are two main types of shower enclosure operation devices available on the common mixer shower - manual mixers and thermostatic mixers. Both mixers provide the same end result of allowing water to flow from the shower head when you want it to and how you want it to, but different users have different operation preferences. 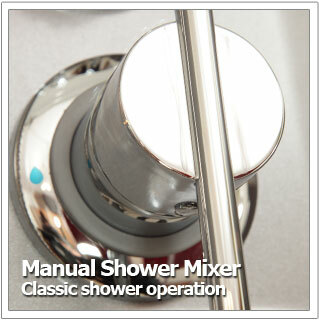 Manual Mixers - The classic method of shower mixing used by most showers available on the market is the manual mixer. The user is able to manually adjust the temperature of the water by turning the mixer in a corresponding direction for more hot or cold water. 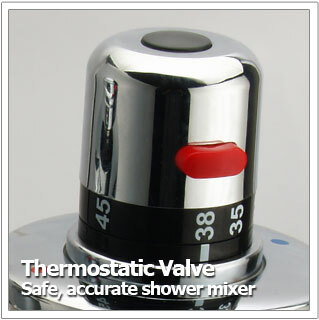 By adjusting the direction of the mixer, the user is able to manually achieve the shower temperature that they desire. 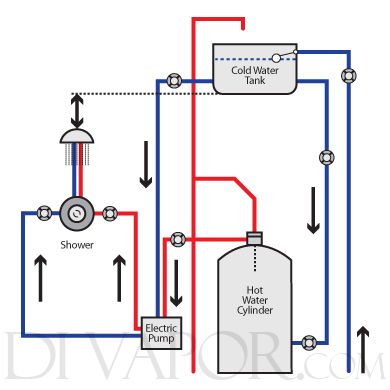 As the manual mixer works from the mains feed of the cold water supply and the mains feed of the hot water supply, the pressure is typically higher than most electrical shower systems. However, manual mixers are unable to balance the pressure of both water feeds so a pressure equalising valve is required. Without a pressure equalising valve, the user may find that hot and cold water pressure can drop suddenly when called from another outlet. Manual mixers are generally cheaper to purchase than thermostatic mixers, but they do not offer the safety benefits or operation management. Thermostatic Valve Mixers - A thermostatic valve utilises a temperature sensitive cartridge (often made from ceramic) mounted inside the main housing of the valve. A thermostatic valve allows the user to set a constant temperature for the water output, with pressure often set by a simple level valve. By working to maintain a constant temperature, using a thermostatic valve eliminates unexpected fluctuations of hot or cold water when called from different outlet. Instead, the valve will automatically compensate either supply in order to maintain the user set temperature. Due to this built in "safety feature" thermostatic valves have gradually become the first choice for many home users, providing the safest form of showering for any age group. Most thermostatic valves are factory set to manage incoming water at a maximum "safe" temperature (usually around 38) but this can be manually adjusted easily by the user depending on preference. Thermostatic valves also work well in most systems but are not advisable for systems with consistent imbalances in pressure. If this is the case with your water system, be sure to check ensure that your water flow to the cabin can be kept at a constant through the use of pressure equalising valves or isolating valves. If such precautions are not taken, it is common for a thermostatic valve to malfunction and not operate as expected. Long term usage in poor circumstances could cause permanent damage to the internal workings of the thermostatic core, which could lead to needing a replacement. Replacing a thermostatic valve can one of the more expensive elements of shower enclosure maintenance so take extra precaution.